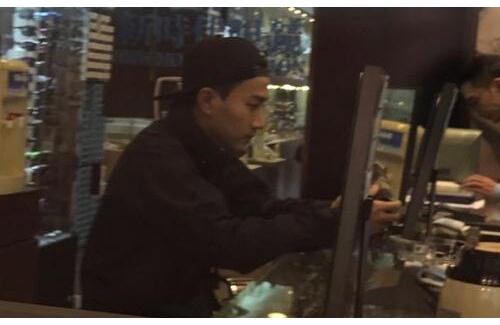 Rumors clearly took a toll on Hawick Lau (劉愷威), who looked haggard and tired when netizens spotted him in Causeway Bay, Hong Kong, shopping by himself. On December 8, a netizen on Weibo shared a photo of a bare-faced Hawick, alone in Hong Kong, shopping in an eyewear store in Causeway Bay. Hawick appears to be a frequent customer, as he chatted with the store’s staff like old friends. Fans had walked up to Hawick and asked for photos, but Hawick politely declined. He took off his cap and said he looked too sick. This is Hawick’s first public appearance since the breakout of his rumored infidelity scandal, dubbed “scriptgate.” The scandal started last month, when Hawick was photographed staying in Angel Wang’s (王鷗) hotel room for long periods at a time. Hawick and Angel were shooting the television drama The Legend of Jade Sword <莽荒紀> in Karamay, Xinjiang. When the scandal first broke out, Hawick reasoned that he met up with Angel only to talk about their script. However, the tabloid that broke the news revealed that Hawick and Angel have been alone together in the hotel room in more than one occasion, and without the presence of staff. Hawick’s wife, Yang Mi (楊冪), have said she believes in Hawick, but made no further comments. Hawick, and his father Lau Dan (劉丹), also stayed silent. Clearly they were both not ready to settle down in the first place. Who the hect lets the grandparents take care of their child for 2 years?! And now this. I’m sorry, but looks like they shouldn’t have been married to begin with.